Surprisingly low price for this capable overdrive with plenty of gain. Flexible. Won't obscure amp's character. Smooth tones. Some may want more attitude from an overdrive. 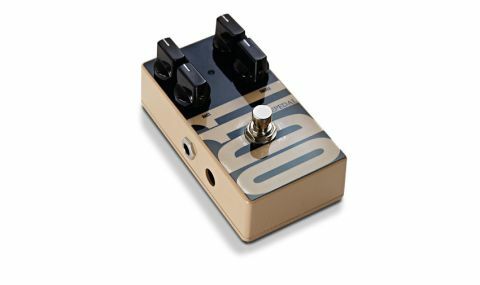 Less expensive than LovePedal's other drive pedals, the OD11 is a four-knob overdrive in a compact housing. Standard level and drive controls do what's expected of them, but instead of the Glass knob that you find in Lovepedal's Eternity and Kalamazoo overdrives, you get standard bass and treble controls here. "We'd recommend it as a great all-round overdrive"
This pedal is designed to be pretty transparent and not mess with your amp tone, so there's enough gain at a minimum level of the drive knob for a clean boost, while the familiar Lovepedal overdrive is here with tone knobs that can really fatten up the bottom end and dial in a touch of clarity at the top. In fact, we'd say it's the smoothest sounding of the drives in the Lovepedal range, and probably the one with the least individual character - not necessarily a bad thing, it should be said. All of the Lovepedal drive pedals sound classy, so without any obvious signs of being much more cheaply made, this is a particular bargain. We'd recommend it as a great all-round overdrive.